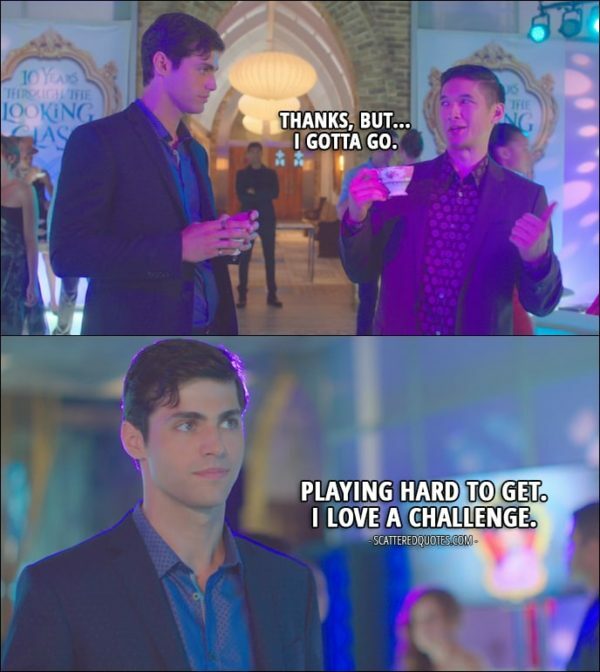 Magnus Bane: For the right price. Magnus Bane: You. In fact, I’ll do you pro bono. 5.6.2017 You. In fact, I’ll do you pro bono. Jace Wayland: Come with me. We'll fight Valentine the right way... together. Alec Lightwood: If we do that... we'll be considered traitors like Mom and Dad. Jace Wayland: I'm begging you, my parabatai... my brother. Please, Alec, come with me. 29.5.2017 We’ll fight Valentine the right way… together. Alec Lightwood: I'm getting married. Isabelle Lightwood: You're on Alec's side now? Alec Lightwood: We swore to protect each other, of course he's on my side. Jace Wayland: I'm not picking sides. Jace Wayland is Switzerland. 29.5.2017 Jace Wayland is Switzerland. Alec Lightwood: I’ve done everything for my parents… for the Clave and… I’ve done everything that they’ve asked. Magnus Bane: Maybe you should start living for yourself. Do what’s in your heart. Alec Lightwood: I can’t believe I’m saying this. I think you’re right. 29.5.2017 Magnus is, um… quite magical. 26.5.2017 You come here often? Isabelle Lightwood: Slept at Magnus' place? Alec Lightwood: Didn't do much sleeping. I was helping treat Luke's wounds. That's all. Isabelle Lightwood: Nothing. I believe you. 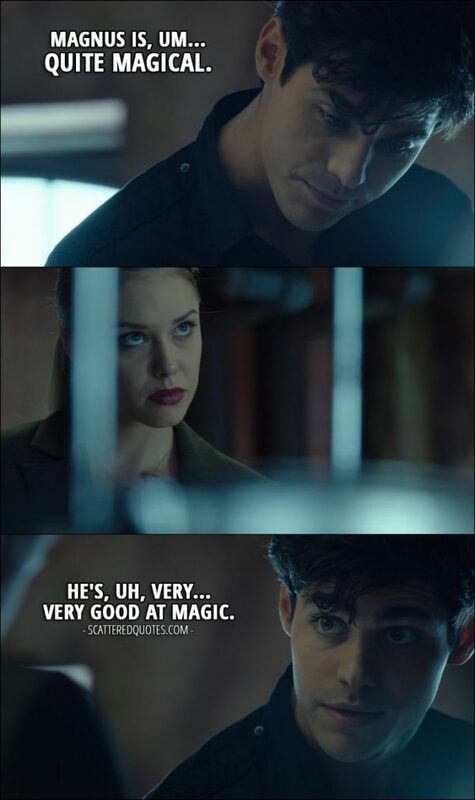 Alec Lightwood: Okay, Magnus made cocktails. I'm telling you, nothing else happened. 26.5.2017 Slept at Magnus’ place? 25.5.2017 I wanted to see you again. Alec Lightwood (to Izzy): I have followed every rule. I’ve given up everything! Screw the rules. Screw them. Screw all of this. 25.5.2017 Screw the rules. Screw them. Screw all of this. 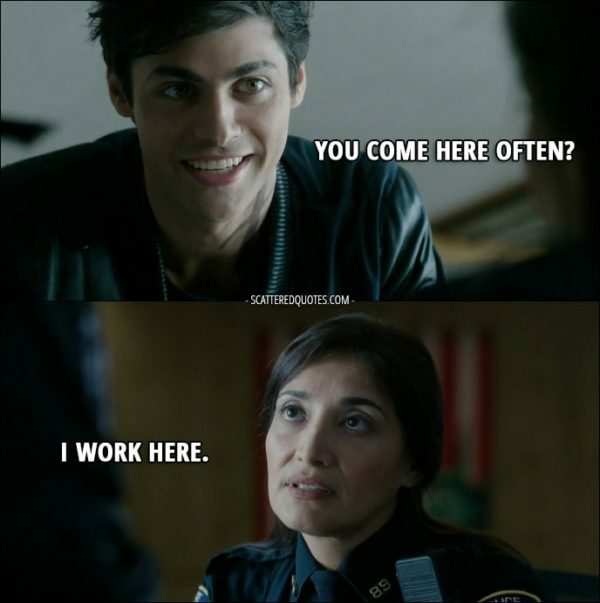 Alec Lightwood (to Maryse): We’re Lightwoods. We break noses and accept the consequences. 25.5.2017 We break noses and accept the consequences. Clary Fray: This is from when Simon and I were engaged to be married. Simon Lewis: We were eight years old. 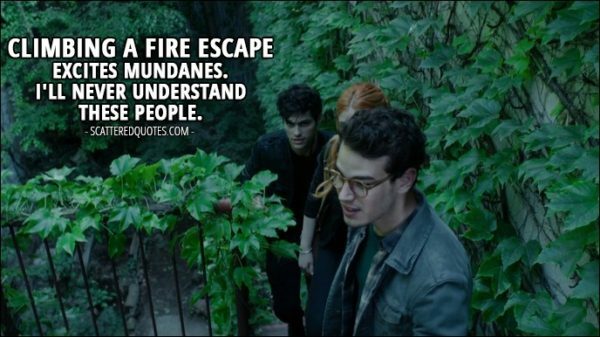 Clary Fray: That was a whole other world ago. 18.5.2017 That was a whole other world ago. 18.5.2017 Climbing a fire escape excites mundanes. Alec Lightwood (to Clary): And what’s the point of an Invisibility rune if you don’t silence your phone? 18.5.2017 What’s the point of an Invisibility rune if you don’t…?